This is one of the three instructional books written by Will Eisner. The other two are Comics and Sequential Art and Expressive Anatomy for Comics and Narrative. Telling a good story is an incredibly difficult. 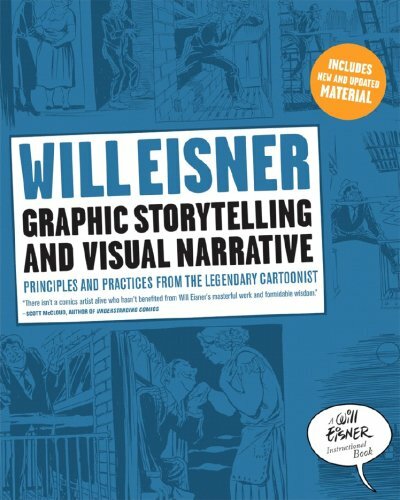 In this book, Will Eisner shares with readers some of things to be aware of when tackling storytelling using comics. He talks about techniques to use to help build a more convincing story. This would include comic tools like lettering, building momentum, using visual clues and writing. Examples include how props (i.e. guns) are held to reveal human characteristics. There are lessons on how to engage readers, how readers think and mistakes to avoid. These are followed with lots of comic strip examples — including a selection from different comic artists. Unfortunately, they aren't captioned page by page like it was done on his other books. The comic examples are great, you know it but you don't know why they work. The book doesn't really go in depth into all aspects of storytelling. There's no talk on character development, story arcs, conflict management and specific story elements and tools. Overall, this is still a very useful book for anyone who's just starting out and thinking of drawing their own comics.